There is a good news for you, you can save much money at Wismec official authorized distributor online store, the first discount code activity officially launched. 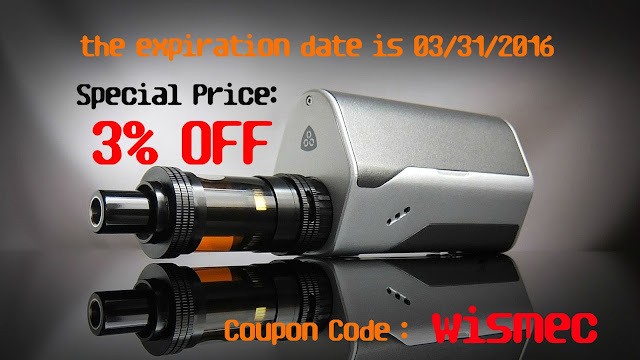 By the end of March 31st, 2016, you can enjoy 3% off on your total purchase, all products in the store wismec.org. there is not much time to waiting for you, you should catch the chance to enjoy it. Remember the disount code is "wismec", take it now, you are lucky one. What’s new about Presa TC100W? The upgradeable firmware of Reuleaux RX200? Why there are 3 battery cells in Reuleaux RX200? What is new in Wismec Presa TC100W?